North African food is very healthy. It is mainly made from a variety of fresh vegetables and dried pulses. Beef is commonly used. Other meats used are lamb, chicken and fish. To these they add spices, herbs, raw olive oil and dried fruits and nuts. Most dishes are served with couscous – a type of grain-like pasta made from wheat flour. North African food has a unique sweet and spicy taste. It is a fusion between Mediterranean cuisine, Arabic, Andalusian and Berber. The spicy meat and vegetables are slow cooked in a tagine – an earthenware dish with a tall cone-like lid. The couscous is steamed separately. Today I would like to share with you a recipe from Morocco. Vegetable couscous is a typical recipe. You can come across variations of it. This is my favourite version. Soak the chickpeas for a minimum of four hours or overnight. Drain, rinse and cook in large pan. Bring water to a boil, lower heat and simmer partly covered, for one hour or until chickpeas are cooked, but not too soft. Heat oil in heavy based pan and saute onion and cinnamon stick until onion is soft and transparent (do not brown). Add eggplant, carrots and potatoes. Cover and sweat for ten minutes, stirring with a wooden spoon from time to time . If the mixture is too dry, add two tablespoons hot water. Add pumpkin, zucchini, beans, allspice and Harissa. Mix well so that all the vegetables are covered with the onion and spicy mixture. Cook for three to five minutes. Pour in boiling water and add chick peas. Cover and simmer gently for ten minutes. Stir in the chopped tomato and continue simmering for a further five minutes or until the mixture thickens slightly. Serve with chopped parsley and coriander. Couscous: place couscous in a pan and pour boiling water over it. Stir well. Add olive oil and give it a good stir so that all the grains are glistening. Cover with a tight-fitting lid and allow to stand for ten minutes until all the water is absorbed. Place on a very low heat for two to three minutes, stirring continuously to make sure the pasta is free from any moisture. 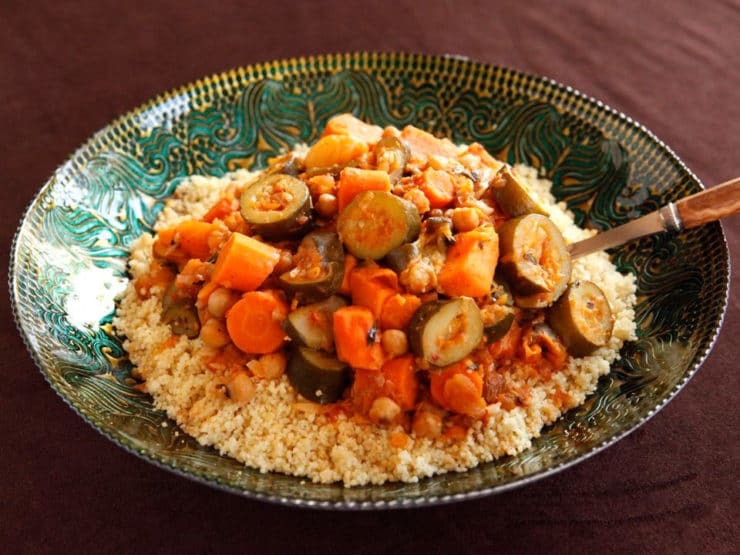 Serve couscous in a large platter topped with the spicy vegetable stew. Enjoy.